This website serves as the project archive for Michael Jones McKean’s The Rainbow: Certain Principles of Light and Shapes Between Forms presented at The Bemis Center for Contemporary Arts from June 21 through September 15, 2012. The project created a simple, but phenomenal visual event — a rainbow in the sky. 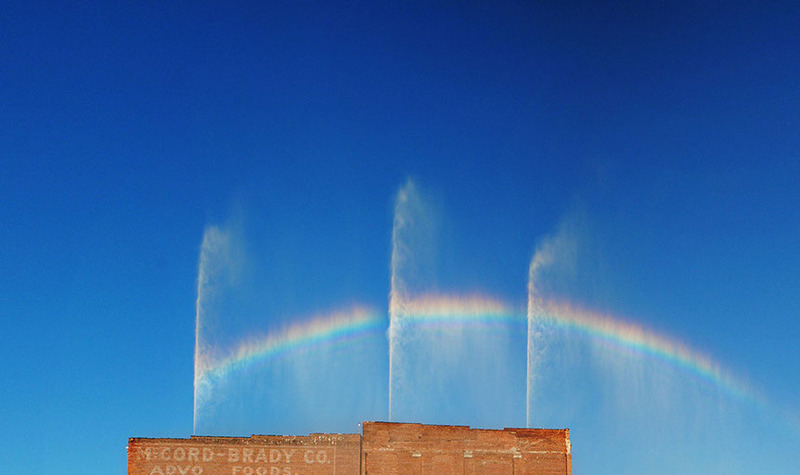 The public artwork produced temporary rainbows above the Bemis Center for Contemporary Arts in Omaha, Nebraska using the most elemental materials: sunlight and rainwater. Throughout the summer, at scheduled times a rainbow appeared above Bemis Center's downtown building. Extensive modifications to the Bemis Center's five-story, repurposed industrial warehouse took place — creating a completely self-contained water harvesting and large-scale storage system. Throughout the project cycle, collected and recaptured stormwater was filtered and stored in six above-ground, 10,500 gallon water tanks. Within the gallery, a custom designed 60-horsepower pump supplied pressurized water to nine nozzles mounted to the 20,000 square foot roof of the Bemis Center. At timed intervals, in the morning and early evening, a dense water-wall projected above the building in which a rainbow emerged. This commissioned artwork represented extensive cross-disciplinary collaboration. Irrigation and rainwater harvesting experts from Omaha-based Lindsay Corporation and Watertronics, structural and mechanical engineers, atmospheric scientists, plumbing and electrical experts and Bemis Center staff joined artist Michael Jones McKean in creating a wholly integrated system for this site-specific, temporary work. Leading to the production of this work. McKean began conducting ongoing experiments starting in 2002. He established a relationship with the Bemis Center as an artist-in-residence in 2004. Eight years later, McKean's work was realized at the site of his residency. Whether perceived immediately as an artwork or not, the experience holds the power to connect diverse publics through an intangible, shared encounter. Within Bemis Center's exhibition space McKean grouped artifacts and sculptures that suggest specific histories, time signatures and values. Among these objects are a 110 pound 5,000-year-old Campo de Cielo meteorite, a shell recovered from the deep Pacific Ocean, a living Bristlecone pine tree (the oldest living thing on the planet, containing DNA sequencing to outlast all living things) and an American quilt completed in 1880. These objects were paired with a simple glass prism and light source, casting a small perpetual spectrum.